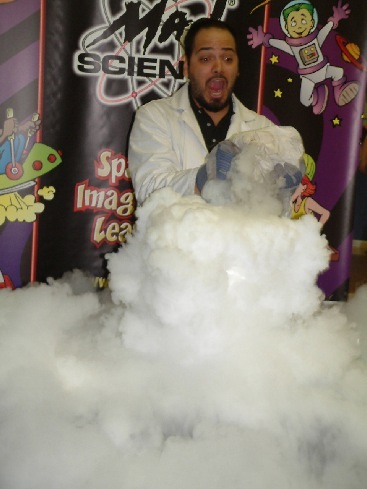 Your Mad Science party at Applebee’s™ will be filled with engaging, hands–on experiments that include things like tornado tubes, electricity experiments, chemical reactions that produce light, air pressure activities, indoor fireworks other great demonstrations. All parties end with a Mad Science® chemistry take-home for every child and Applebee’s™ delicious food package! We offer three different levels of service and all parties will include 45- minutes of awesome Mad Science® activities, invitations, a take home chemistry experiment for all guests & a poster for the birthday child as well as an Applebee’s™ meal for every guest. All party packages include our amazing Bubbling Potions Finale, Mad Science® Goody Bags, and a Mad Science lab coat for the birthday child! For a list of all Apple Metro locations, please click here. For more information on available packages, contact the Group Sales and Corporate Event Department at Apple-Metro, Inc.